← Cooperstown Prepares For 46th Annual Winter Carnival And A British Invasion! First Annual ‘Festie’ Awards To The Top 5 Festivals of 2012! Each year, the Festival Fanatics will list our five favorite festivals that we attended in the calendar year. This is the first year of our website and we attended a number of festivals in person in 2012. Thanks to the more than 14,000 “fanatics” who have visited us over the last year. And now (drum roll please) it is time to give out our prestigious FESTIE AWARD to festivals of distinction in the year 2012. Dan has been to the Apple Harvest Festival annually since his college days. It is the marquee Ithaca event of the fall. What other small town festival boasts 12,000 visitors, endless apple products, and, perhaps best yet, BEER! Crowded shoulder-to-shoulder on The Commons in Ithaca, the Apple Harvest Festival — or Applefest to the locals — showcases the great orchards, farms, wineries and microbreweries in central New York. There’s live music, street performers, endless food, and it is a draw for anyone in a 100-mile radius. This was the first year for this fun festival, held on the banks of the Hudson River, Labor Day weekend. We basked in the glory of everything bacon in a beautiful waterfront park. Live music, many interesting vendors, more than 1,000 festival goers and the smell of bacon wafting over the whole event..it was bacon heaven. It was so well-attended that they actually had to refund advance ticket purchases because they were out of bacon-flavored items. 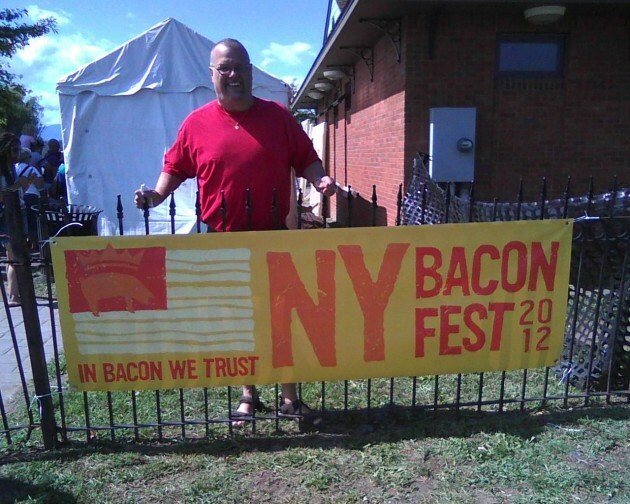 This is surely to become one of Upstate’s premier festivals, food or otherwise, in the future. The Dickens Christmas in Skaneateles has been in existence for 17 years, and every December, the Characters from the Charles Dickens classic “A Christmas Carol” descend upon the city. We happened to go on a cold, rainy, windy and otherwise miserable day. Yet, we had A BLAST! We met with Scrooge, Santa, and Dickens himself. We saw carolers, Tiny Tim and other Victorian-era characters walking the streets. The thing that struck us about this festival is that no matter what we tried to do, we couldn’t get any of them to break character. In addition to all of this, there are numerous shopping deals and all of downtown is humming with activity. We will likely go again next year. Leave it to Hamilton to turn a tragedy into a festival. Recently the village has been paying tribute to this odd event with a Chocolate Train Wreck Festival. It was held September 29, 2012 this year. I attended. It took place on the village’s beautiful town square and consisted of a large loca farmer’s market, many musical acts performing in the band gazed, plus lots of memorabilia about the 1955 wreck. Yes, you could buy a chocolate train! And yes, you could watch an archival newsreel of the actual wreck from a half-century ago. 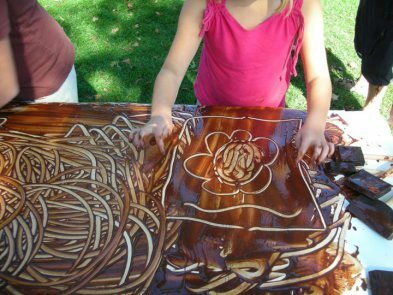 And yes, kids even got to finger paint with chocolate! (see below). This fledgling festival wrapped up its third year, and thanks to the celebrity power of Amazing Race winners The Beekman Boys, it has become a go-to destination for that one weekend in December. The Beekman Boys, dressed in Victorian garb, remained outside their Beekman 1802 store all day, greeting visitors, fans and autograph-seekers. Big Chuck noted that every year he goes to the Victorian Christmas, he notices a new store has opened on Main Street. The celebration brings people from all over the country — we met a group from Boston — and is one of the showcase events of the year. This is a great, small festival. 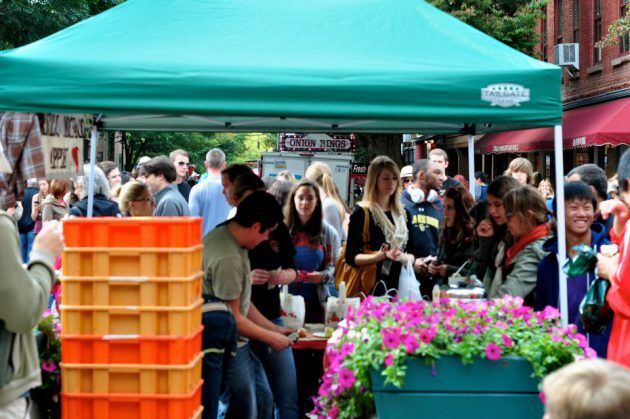 Ithaca Apple Festival is One of Upstate's Largest Parties!In "Tompkins County"
One Response to First Annual ‘Festie’ Awards To The Top 5 Festivals of 2012! Check out Friends of the Farmer Hudson Valley food lovers festival benefiting FarmOn! Foundation with Cornell to raise funds and awareness for farming our future. Chef David Burke will host the Hootenanny! Five mile pig roast and thousands attend from near and far to meet your farmer, stand up for your farming community and food choices. Join us July 19 & 20, 2013 and support local honest food. FarmOn!